This effort has resulted in two new products, the Spectraval 1501 and Spectraval 1511. Each performs the same, but offer different user interfaces. The 1501 (pictured on the left) must be controlled by PC software, just like the JETI 1211. However, the 1511 adds a small LCD screen that allows the user to take measurements and view results without ever connecting to a PC. However, at some point in the display measurement process you will probably want to connect to video calibration software for analysis and reporting, which is why we offer the Spectraval 1511 bundled with ChromaPure Professional. Both the 1501 and 1511 offer built-in Bluetooth, which allows wireless connection to the PC for added user flexibility. Otherwise, the Spectraval units offer similar speed, accuracy, and repeatability to the 1211 in addition to offering even higher dynamic range through greater maximum luminance. The 1211 offers a wider spectral range, but this is unnecesary for measurements in the visible range. To top it off, the Spectraval units are less expensive than the 1211. 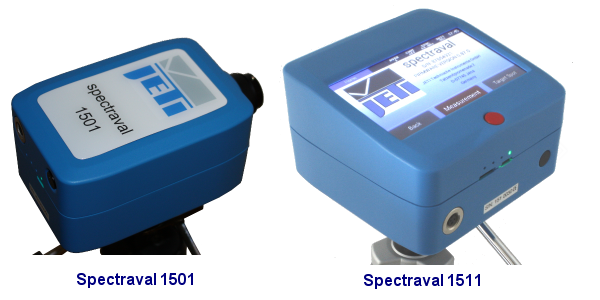 The JETI Spectraval 1501 spectroradiometer is the most affordable true reference device available, and the Spectraval 1511 is less expensive than the JETI 1211 with similar performance and significantly enhanced user flexibility. Just mount either on a tripod, facing towards the source, connect to ChromaPure Professional and use as you would any other color analyzer.